PULLUPS: Power of women’s strength! 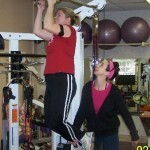 Amy and Lauren are personal training partners. They share the hour together and they both have made some awesome changes. Amy does not notice the back pain much any more. Lauren has gotten back her leg strength from knee surgery a few years ago. They both feel increases in endurance and strength. When they know they have “assisted” pullups they resist… maybe the fear they can not do them, or knowing how hard they are or how sore they will be the next day…. Just goes to show you, when you put in the effort, the rewards are GREAT!